This is a great alternative to beef chili, the tofu has a very honest and perfect texture and performs really well along with the rest of the spices, a very good and authentic Mexican vegetarian meal. 1 (15oz.) can of black beans (drained & rinsed) if using for taco filing. For Tacos, Burritos or Enchiladas: 12 warm soft corn tortillas, 3 cups of shredded green leaf lettuce, 1 ½ cups shredded cheddar or Monterrey Jack cheese, sour cream. Put drained and pressed tofu, chili powder, oregano, cumin, coriander, salt & pepper into a bowl and mash together with a fork. Set aside. Heat the olive oil over medium heat in a wide heavy-bottomed skillet. Add garlic and the onions and green chilies and cook until fragrant, about 2 minutes. Add tofu mixture, the corn, the tomatoes and tomato sauce. Cook stirring occasionally, until most of the moisture has evaporated for about 10 to 12 minutes. Add the black beans and stir well and cook until heated through, about 2 minutes longer. 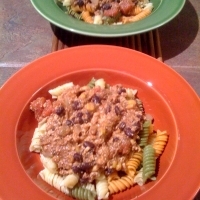 Serve Black Beans & Tofu with white or brown rice or in tortillas, topped with lettuce, tomatoes and cheese or over pasta. NICE TOUCH ABOUT HOW TO USE THIS FOR TACOS,BURRITOS AND ENCHILADAS!BIG HIGH 5!!! !